Coat a 13x9- inch baking dish with cooking spray. 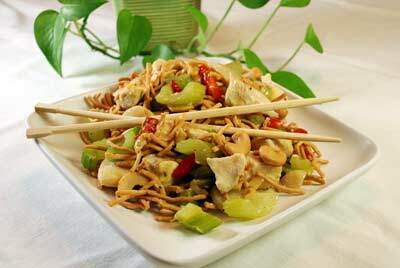 Combine chicken, celery, water chestnuts, soup, pimientos, soy sauce and pepper in baking dish and stir until combined. Top with cashews. Bake at 350 degrees F for 30 minutes. Remove from oven, top with noodles and return to oven to bake for 10 minutes more. Serve immediately.